Thomas H. Jones. The Experience of Rev. Thomas H. Jones, Who Was a Slave for Forty-Three Years. 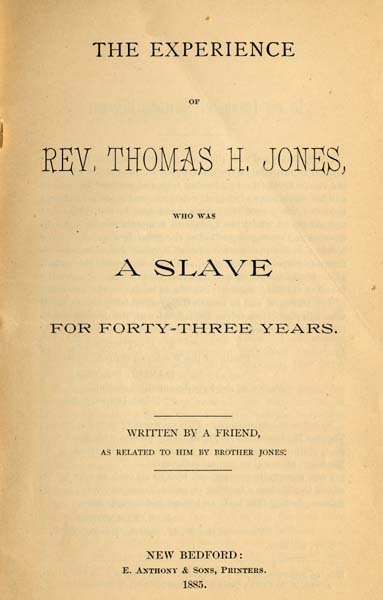 Written by a Friend, as Related to Him by Brother Jones. The Experience of Rev. Thomas H. Jones, Who Was a Slave for Forty-Three Years. Written by a Friend, as Related to Him by Brother Jones. New Bedford: E. Anthony & Sons, Printers, 1885.